After two fantastic seasons of unparalleled success, Golden Hair & Fashion Show ‘15’ is aimed towards bringing Avant-garde Fashion Designers, Top Hairstylists, Top Models and Fashion Photographers all together on one platform to promote and advance the cause of Ghanaian Fashion to a global audience. Gold Model Agency & School (GMA) is pleased to announce that, Golden Hair & Fashion Show ‘15’ is taking a giant leap forward and moving our annual flagship fashion event to World Trade Center, Accra on October 10,2015, exactly 6pm as part of the activities marking the graduation of Models from the school. Tickets selling at 50cedis for regular and 100cedis for VIP. This year’s event promises a world class production from exclusive Hairstylists and hottest up-and coming designers such as KyeradeGh, Kophi Faakye, Jama Clothing, Twens Fashion House, Ange Suraji, Lissa Mykels , Numar Clothing, Emco Designs and many more as well as guest Top Designers; Wendy L‘artisane, and Afriken Novelty . Team is committed to making this year’s event one that goes down in History but not forgetting our media partners; Fashion Ghana, Ytainment, Fashiongh, Monte Oz , Yfm, FashionistaGh, Ahwenepa, Campus World Magazine, FashionmaniaGh and X Project Ghana. All corporate bodies and individual interested in getting involved as a sponsor, Press, Designers ready to exhibit/showcase on the runway, should kindly contact goldmodels94@gmail.com or +233546274949/+233266423747. 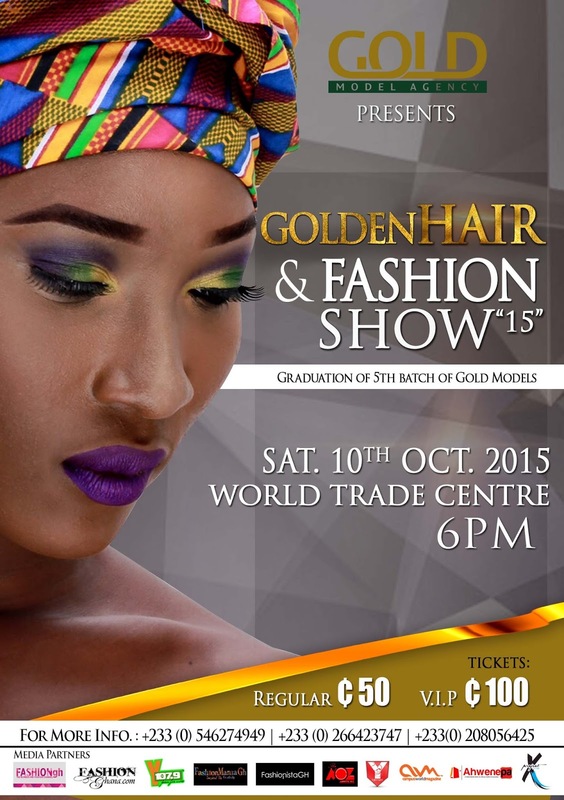 We look forward to seeing you at the World Trade Center, Accra on October 10, 2015 exactly 6pm.It’s all about Golden Hair & Fashion Show ‘15’.